The unit has a thumb adjustable taper lever that allows you to select the desired length right during the trimming process. Its ergonomic design ensures full and precise control and prevents accidental switching. The included cleaning brush could be of better quality. 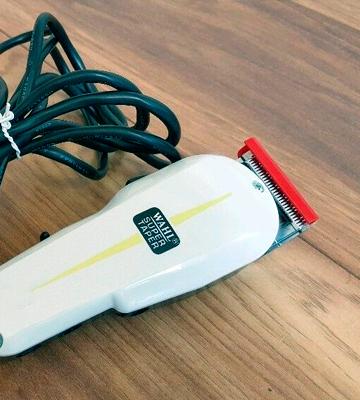 This corded hair clipper is equipped with a powerful motor that delivers up to 6000spm trimming speed. Moreover, you can use it continuously, which makes the Wahl Super Taper hair clipper a perfect choice for professional use. 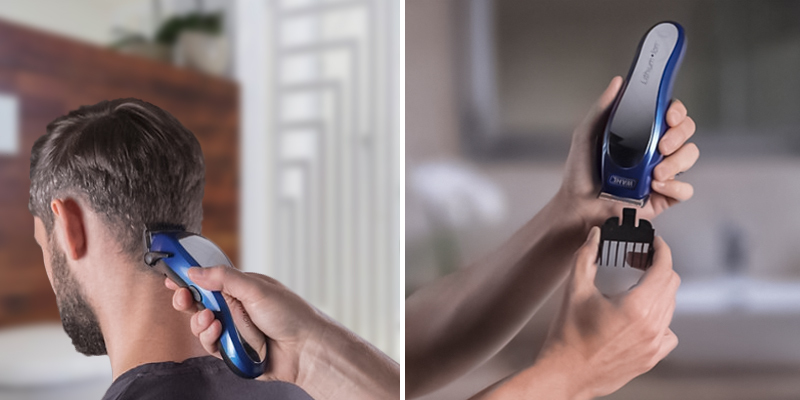 This Philips hair clipper has an ergonomic zoom wheel for easy length adjustment (1-23 mm with 1 mm increments, or 0.5 mm trim with no comb). It might take you some time to get used to the handle. 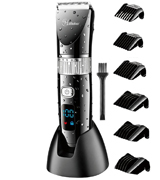 Innovative technology and the highest built quality of this hair trimmer ensure the best performance. It uses self-sharpening titanium blades with DualCut™ technology that are extremely sharp and never require oiling. The unit has a thoughtful design with special vents for motor cooling. 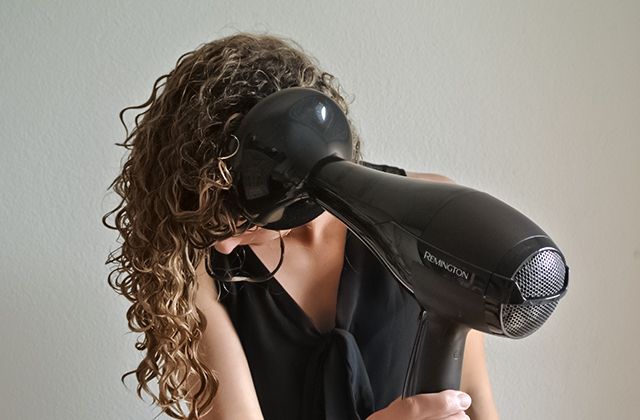 This will prevent the haircut machine from getting overheated even if you use it for a long time. The unit might seem a bit noisy. 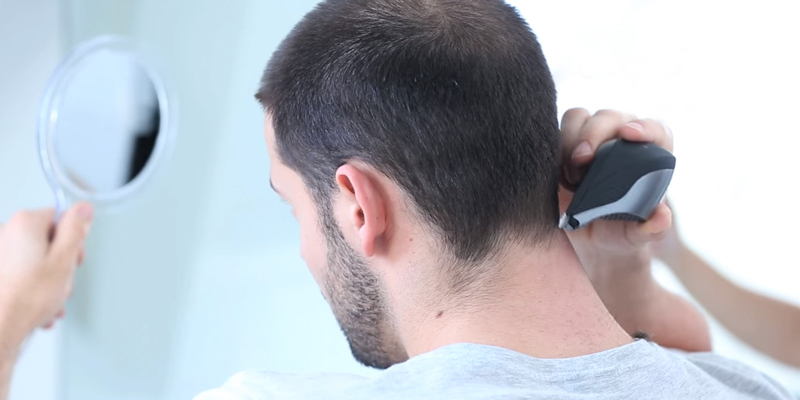 This portable and lightweight electric hair clipper can be used with or without a cord. The item will be appreciated by both experienced and novice barbers. With this tool at hand, hair trimming will never be a long and tiresome task anymore. The package includes two batteries, so you can replace the used one with a full one just when needed. The unit can be charged not only from the mains but via USB port as well. If you use it for too long, the motor might heat up a bit. 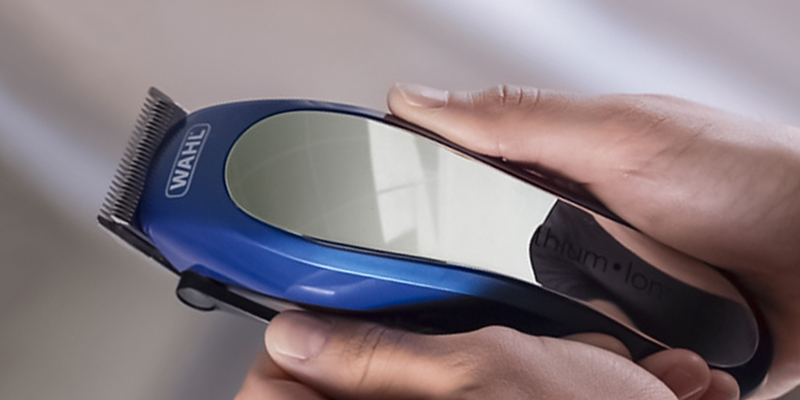 Boasting intuitive operation, this model will be easy to use even for novice barbers. 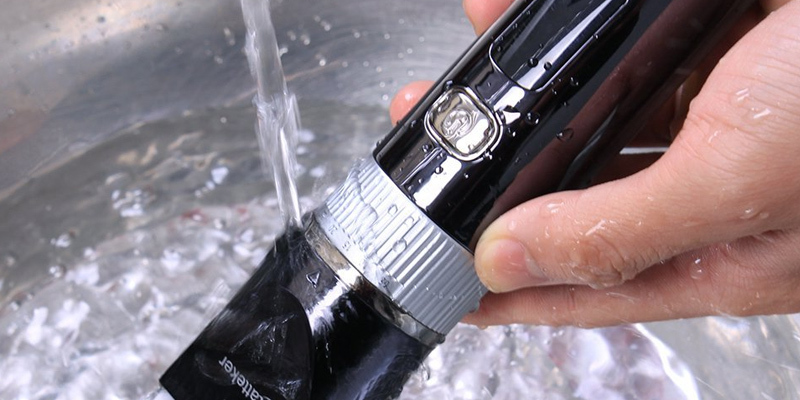 Being 100 % waterproof, the Hatteker RFC-690 01 is very simple to maintain - just wash it under tap water after use. 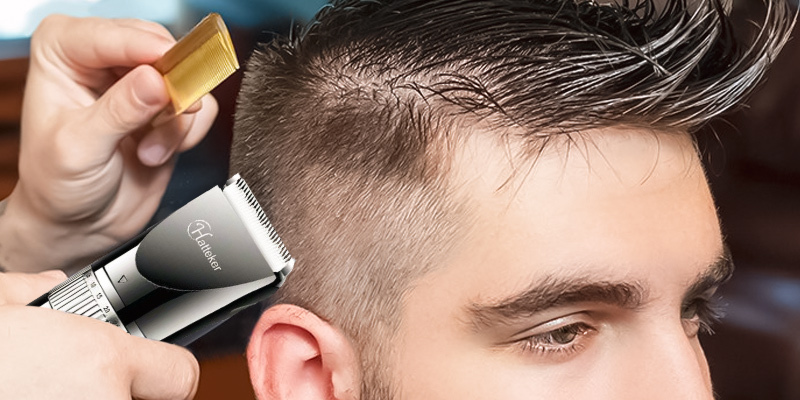 Its patented CurveCut™ blade is made of quality stainless steel and has a curved edge to follow the contours of your head to ensure fast and easy trimming. Works just as well for neckline and sideburns. The cutting length can only be adjusted with the included comb attachments. This small hair clipper will make self-grooming a simple task even during long journeys and business trips. It is an excellent choice for those who want to look spick and span anytime, any place. 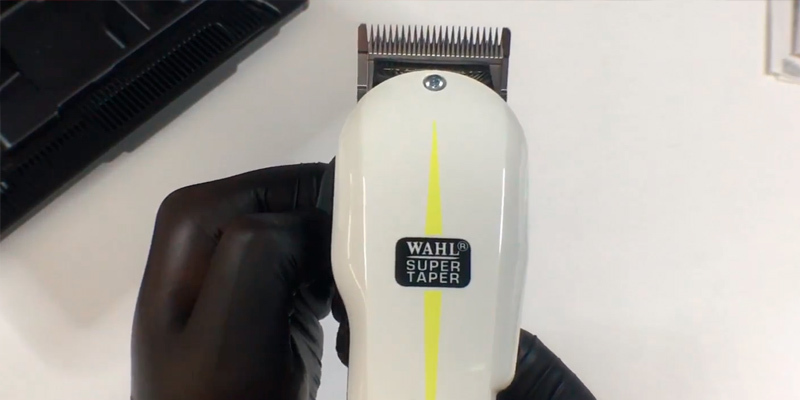 According to many reviews, the Wahl Super Taper hair clipper is considered one of the best professional choices. Boasting an ergonomic design making the process of trimming as comfortable as possible, this model has a powerful and durable motor that can ensure excellent performance even in case of heavy use. 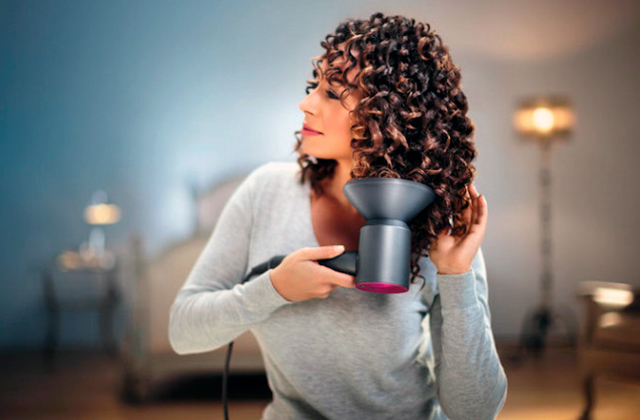 The motor delivers up to 6000spm trimming speed and makes the bulk removal of hair an easy task. As the unit is corded, it can provide exceptional power. Plus, there is no battery to die before the haircut is finished. 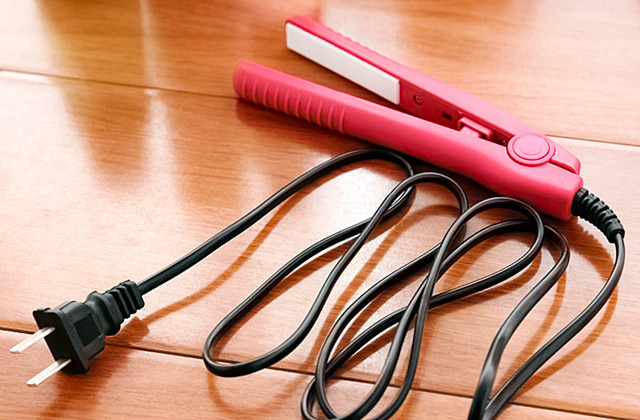 To ensure the most convenient operation, the trimmer is equipped with a 3-m cable. This model has a thumb adjustable taper lever that will allow you to change the cutting length even without changing the attachment combs for quick and professional tapering and texturing. Without any attachments (we'll talk about them later), the unit can be adjusted for 1 mm - 3.5 mm cutting length. Being an excellent choice for busy salons, this Wahl hair clipper is also a fantastic pick for home use, especially if you have curly or thick hair which is not so easy to cut. Though the unit might seem somewhat pricey, it is worth every penny it costs. The hair clipper is equipped with the highest quality chrome-plated blades that are made to last. 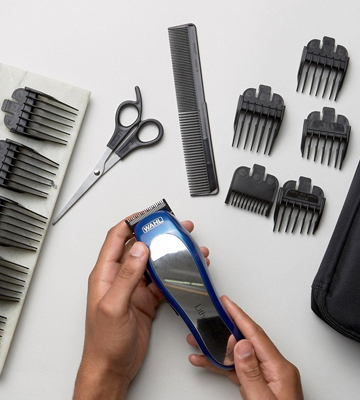 In addition to the Super Taper clipper, the box includes 4 attachment combs, a blade guard, a small flat top comb, a cleaning brush, an instruction booklet, and blade oil. Therefore, you will be able to clean blades and oil them as required, which will help you to enhance the performance and prolong the service life of the unit. As for the attachment combs, they have the following cutting lengths: 3 mm, 6 mm, 10 mm, and 13 mm, so you can choose the most appropriate one for your grooming tasks. For professional use, you might want to get more attachments offered by the manufacturer. However, for home use, the provided combs are, in most cases, enough; some consumers even use the unit for beard trimming. In a word, when it comes to the jobs the Wahl Super Taper was designed for - hair cutting, tapering, and shaping - you will hardly find a better choice for either home or professional use. Many users complain that the process of replacing attachments isn't as quick as they'd like it to be. 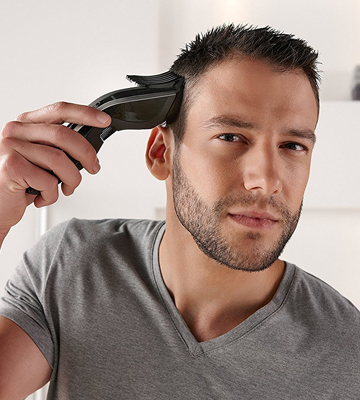 With that in mind, the manufacturer has equipped this Philips hair clipper with an ergonomic zoom wheel for easy adjustment of a cutting length. The zoom wheel with variable lengths from 1 mm up to 23 mm can help you get a neat haircut with no hassle. 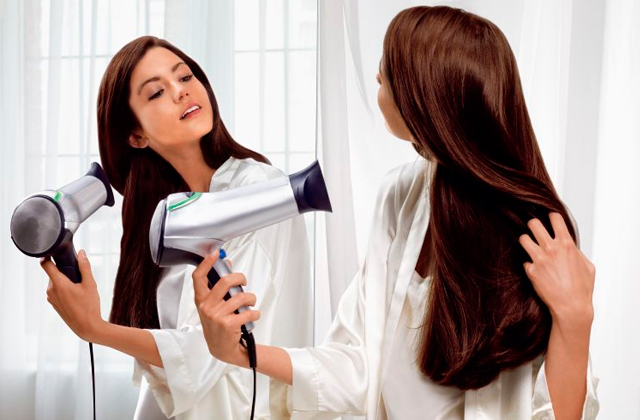 This model can be used cordless or corded. Thus, it will give you a good range of motion when running on a battery or frustration-free operation if you've forgotten or had too little time to charge the battery before use. By the way, one-hour charging will give you 90 minutes of cordless runtime, so, unless you are going to operate the unit for an extended period, you won't have to charge it before each use. For fast and efficient trimming of all hair types, the model boasts self-sharpening titanium blades; an innovative DualCut™ technology ensures minimum friction during trimming. What is more, you can boost cutting speed by pressing a turbo power button for the most effective cutting of thick hair. Yet, the benefits don't end here: the blades are easy to clean under the running water and they require no oiling. All of this allows you to enjoy fast and easy styling requiring very little maintenance. There are not so many attachments included with the purchase, but as they say, it's quality that matters. As the hair cutting length is adjusted by the zoom wheel, the included attachments have other purposes. Give them a closer look and you will see that it is not so easy to find a kit as versatile as this one. For example, in the box, you will find a blue-coloured hair clipper comb that was created for safe and convenient cutting kids hair. Being colour-coded, it is easy to spot among other accessories. To use the comb, just attach it to the machine and select the desired length setting. The tree other comb attachments (1.5 mm, 3 mm, 5 mm cutting length) were specially designed for beard styling. In other words, instead of buying a hair cutting machine and a beard trimmer, you can get this model and groom your hair and beard with the same appliance. An adapter and a hard case for convenient storage of all the accessories also come in the box. 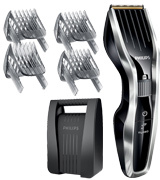 Summing up, if you are looking for a reliable and versatile haircut machine, opt for the Philips HC5450/83. 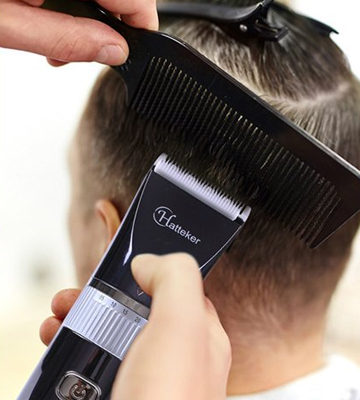 Equipped with a special attachment for trimming kid's hair, it is an awesome choice for a family use. 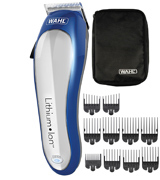 If you have made up your mind to buy a hair trimmer that will ensure professional hair trimming, this Wahl model may be just the one you need. It is lightweight and feels comfortable in hands, so even difficult tasks like trimming sideburns or around the ears are easy to complete. Thanks to the special grinding technology, the blades stay sharp as long as possible. The hair clipper can help you cut through thick hair and have it trimmed as short as you need with no hassle at all; the item's powerful motor will help you do it in the shortest time. The manufacturer has packed it with a Lithium-ion battery that boasts unmatched performance and holds a charge for an impressively long time. To give you freedom of movement during its operation, the unit can run on battery power for up to two hours non-stop, and that's with a one-hour charge time. An ergonomic charging indicator will let you know when the battery is full. Alternatively, you can use the unit with the cord plugged in (this model can be used both corded and uncorded) and do not bother with charging the unit. With the Wahl SPL hair clipper, you can be sure your hair will look great wherever you go. The unit has a worldwide voltage (100-240 V) so you can bring it with you anywhere you travel. A storage pouch to keep all the accessories at hand. In other words, everything you need for hair trimming and styling and for the unit's maintenance is included in the box. Whether you are an experienced or a novice barber, this handy haircut machine is an excellent choice. We also recommend you to get a beard trimmer to make your morning grooming routine a cinch. Ease of use and ease of maintenance are essential things that users look for when choosing a perfect trimmer. The Hatteker RFC-690 01 boasts both of these features, which makes it one of the choicest options out there. It has an ergonomic handle that features an intuitive cutting length adjustment and it comes with capacious Lithium batteries to ensure long and powerful performance. Moreover, the manufacturer claims that this model is completely washable, so there will be no harm if you wash the blade under tap water after use - easy cleaning is a great advantage that will save your time on the morning routine. The appliance comes with a handy charger base, two rechargeable batteries, BS adapter with a USB port, and a USB connector. Thanks to the two batteries included, the cordless clipper can operate for a prolonged period of time, which will come in useful when you are travelling. An ergonomic LED indicator light will show you the battery charging status; 90-120 minutes charging will provide up to 120 minutes of operation. Other important qualities of any self-care device are safety and versatility. This unit features a ceramic cutting blade that allows for a smooth shave without any irritation. Gentle trimming is especially important when styling kids hair, so if you have children, this skin-friendly hair trimmer is a great option. The blade itself can be adjusted for five cutting lengths (from 0.5mm to 2.5mm) - just choose the desired setting on the handle. Plus, there are six guide combs included, so you can set the unit's fine adjustment button for a 4-6 mm, 7-9 mm, 10-12 mm, 16-18 mm, 22-24 mm, or 28-30 mm trimming length. The appliance can be used for both hair and beard trimming, which is a great advantage as well. 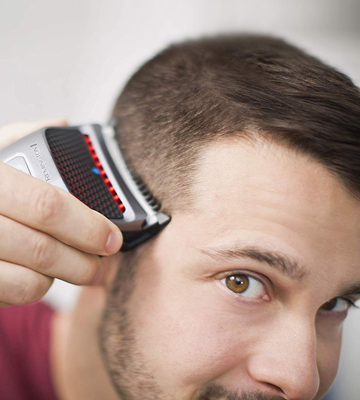 To cut a long story short, the Hatteker hair trimmer is a reliable and user-friendly appliance that, along with all the accessories included, will help you experiment with your style and always look well-groomed. The Remington HC4250 hair clipper looks different than any other model and it feels different in your hand, too. The thing is that this unconventional design is meant to make hair styling and trimming a snap. The blade is pretty wide, which means you can trim more hairs with one movement. 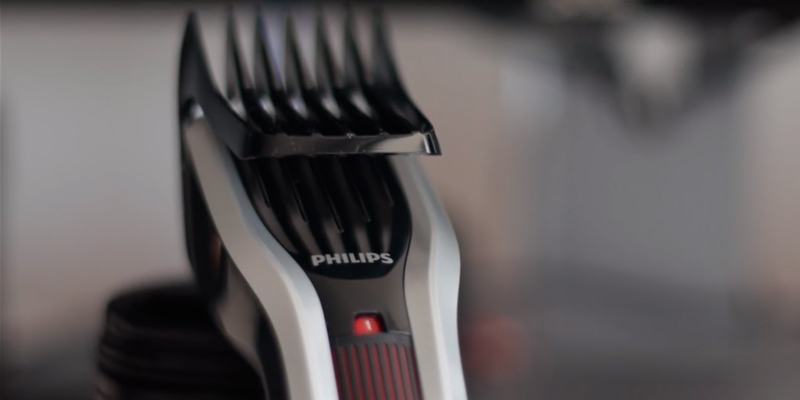 Moreover, thanks to the CurveCut blade technology, the haircut machine follows the contours of your head, making trimming your hair as fast and simple as never before. The appliance sits comfortably in your hand and the risk of dropping it is minimal. In addition to trimming, the device is also perfect for grading and tapering as well as grooming your sideburns. 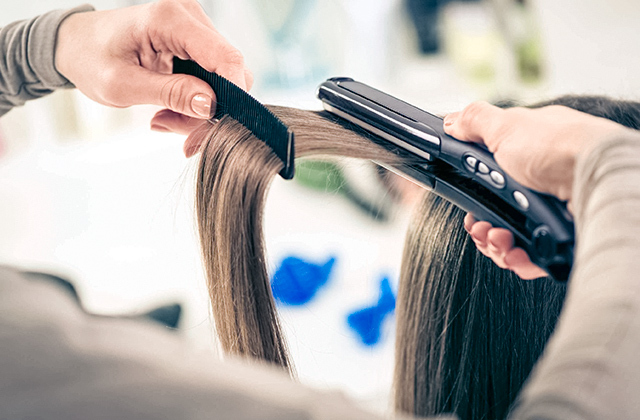 Unless you want the shortest haircut and use the unit with no attachments, the cutting length can be adjusted in the range from 1.5 up to 15 mm by using extra combs. There are nine of them included in the box; just choose the one that offers the desired length and attach it to the machine. A handy case for storing the accessories is also included in the box, so it will be easy to keep them in one place ready for the next use. Lithium batteries provide 40 minutes of operation. This might seem not that long run time, however, considering the ease of use and effectiveness, it is more than enough for creating a nice haircut. As portable, handy, and versatile as it is, the Remington HC4250 hair clipper is an excellent choice for people who often travel. Due to the compact size, it will take minimum space in your luggage. Since cutting your hair is super simple with this unit, you can easily use it even if you travel alone. Besides, cleaning the model is a breeze - it is fully washable, so you can just rinse it under tap water after use. All in all, this small haircut machine is an excellent choice if you want to become a pro barber for yourself and always look great. 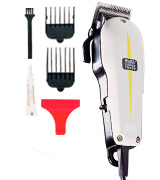 A hair clipper is a grooming electric device designed to cut hair close to head. 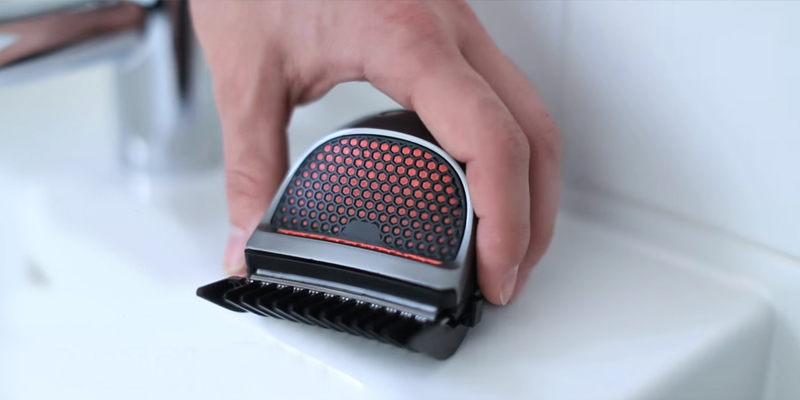 Initially designed for professional use in barbers' shops, today hair clippers can be found in almost every household. And though not all people may describe themselves as pro barbers and boast of that level of proficiency when cutting their own hair, for most it's still much more convenient than to go to a barber's shop. Besides, trimming hair isn't as difficult as it might seem and with some practice, you're likely to hone this craft. Another advantage of owning a hair clipper and cutting your own hair is the fact that you can do it anytime and anywhere. This way, if an urgent situation arises, you won't need to match up a barber's schedule with yours and will be able to handle the maintenance yourself. Finally, it's just a great skill which will allow you to be in total control of your time and desires and be less dependent on other people. Another appliance that will add to the collection of your grooming tools is a high-quality electric razor. If you've no one, we'd recommend you to check out this comparison. Before you decide on any particular model of hair clipper and trimmer, consider what for you’re going to use it. If you plan to cut hair on a regular basis (for example, if you work as a barber in a professional salon), choosing a professional, multi-functional device is important. It will easily cut through any hair types and remove a large volume of hair in one go. In case you look for a hair clipper to use at home and save some money on barber’s service, you can opt for a hair trimmer. Trimmers are good and functional, but they aren’t as powerful as professional haircutting sets. To differentiate between haircutting tools for home and professional use, pay attention to the motor type. Basically, there are three hair clipper motor types - rotary, pivot and magnetic. Clippers with a rotary or pivot motor are commonly recognised as the most powerful and thus, frequently purchased by professional barbers. Such clippers work with various hair length, thickness and coarseness. They also have adjustable blades for disinfection, replacement and easy clean up of the hair. Clippers with rotary motors can be used without a break for a long time. If you look for a reliable and durable haircut machine to use either at a salon or at home, you can go for a mode with a rotary motor. You can also buy a unit with a magnetic motor. It might be less powerful than one with a rotary motor, yet good enough for continuous work for about 20-30 minutes. When used for longer than that, there’s a big chance to build up the load on the motor and overheat it. 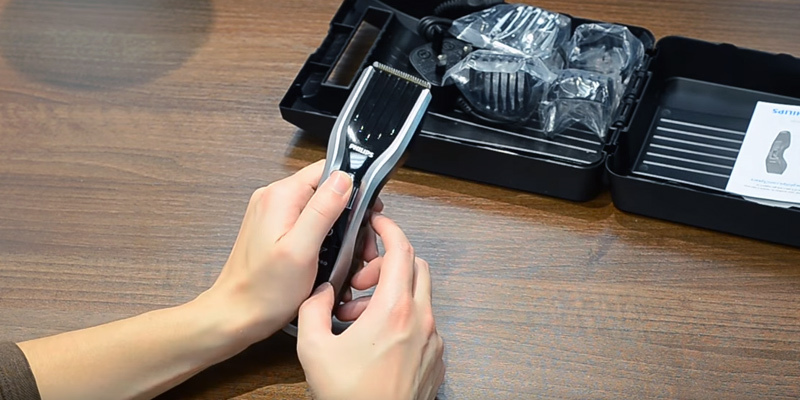 Hair clippers with a magnetic motor are good for occasional haircuts at home. The only thing you might not like about them is noisy operation and slight vibration. Most haircutting sets include different accessories and a number of various attachments and combs for haircut customization. On changing these attachment guides, you can customise the volume of hair that you’d like to cut. You should also pay attention to the shortest and longest hair lengths which can be done with the included kit. The hair length usually varies from 0.1 mm to 70 mm. Powerful and reliable haircut machines all work off the mains. Plugged in the power socket, they can be used for a long time without a break. The only drawback one could spot is their dependency on the electricity. A short cord may also cause discomfort, so it’s worth considering its length before making a purchase. Hair clippers with built-in batteries are good for those who’d like to keep the tool at hand away from home. 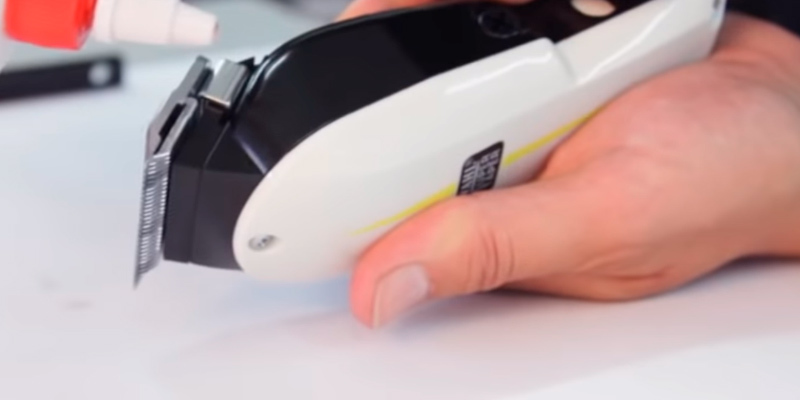 Such clippers ensure smooth operation, they are great for hair, beard contouring and trimming. On a full charge, they can work for about 30-60 minutes while recharging the unit itself usually takes about 8-10 hours. The optimal choice for most is a rechargeable appliance that combines the advantages of the two. 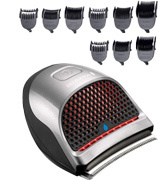 Additional features enhance maintenance and ease of use of different hair clippers and trimmers. We recommend you to consider the design and size of a tool so that it comfortably fits in your hand and doesn’t cause hand fatigue. The handle should have some rubberized components in order not to slip. Some units have special chambers that vacuum the cut hair so that you needn’t sweep the floor after each haircut. They are usually a bit heavier than the units without this chamber, but more convenient to use on a whole. Consider what’s included in the packaging to make cleanup easier. Some hair clippers can be rinsed with water while others should be cleaned with a special brush and lubricated with oil. Hopefully, now you know all you need to know and can get the best haircut machine. It is not a secret that cutting your own hair at home can save you lots of money. Whether you've made up your mind to change your style completely or just want to touch-up your haircut so as to give it a neat look until your next trip to the barbers, a hair clipper can make the trimming and styling process so much easier and become your ultimate assistant. However, unless you want the shortest haircut, it is not only a clipper that you will need. No wonder, most appliances of the kind come with multiple attachments and other accessories. Assorted guide combs will help you choose the desired haircut length, usually up to 25-30 mm (if you want a longer haircut, you will need a pair of scissors which are sometimes also included). There are sets that include left and right ear tapers allowing you to have the hair around your ears cut neatly and easily. Finally, some appliances come with beard trimming attachments for more comprehensive self-care. A versatile hair clipper with multiple useful accessories is a must-have thing to experiment with your style. So, you have got all the required tools and are ready for the first trimming procedure. Following these simple tips, you will be able to cut your own hair quickly, neatly, and easily. First of all, make sure all the tools you might need are close at hand. Then, wash your hair using the shampoo suitable for your hair type. If you have straight hair, the best option is to cut it wet; if you have curly hair, just dampen it so that its curling pattern is not concealed. In case you are going to use a haircut machine, do not forget to read the manual before you trim. Cut your hair in the opposite direction of its growth. Use the longest haircut setting if your hair is long. When you are done, just change the attachment to the one that provides shorter trimming, if needed. Back, side and top styling is to be done in the end. For example, you can do one side, then go to the other, and finish with the back. In most cases, it is recommended to use the shortest comb guides when trimming sideburns or around the ears. When doing the back of your head, a secondary mirror will come in handy. It is the hardest part for many, so if you can, ask someone to help you. If you can't, put your free hand on your head back and try to use it as a guide, dragging the hair clipper alongside it. For trimming the head top, longer haircut settings are usually used. To make the transition between lengths, use in-between numbers of comb guides. Work slowly when it comes to fine detailing to make both sides look symmetrical. When the job is done, take a careful look at your new hairstyle and trim any uneven hair if necessary. With a high-quality haircut machine, trimming your hair is pretty simple, however, like anything in this world, it requires practice. Even if trimming took longer than you expected for the first time, every next session will be faster and easier. In any case, using a hair trimmer, you will be able to save tons of money on visiting the barbershop. And, probably, one day, you may even get inspired for creating new exclusive hairstyles. 1. How to Choose Hair Clippers, eBay. May 21, 2015. 2. Hair clipper, Wikipedia. December 14, 2016. 3. Pamela Miller What Do the Numbers on Hair Clipper Combs Mean? LIVESTRONG. December 21, 2015. 4. How to Cut a Man's Hair, wikiHow.